Chuck Crawford started Delaware men’s rowing team in 1991 with a dedicated group of student-athletes. While simultaneously coaching the women’s program, which had its inaugural season in 1990, Chuck spent the first year teaching the all-novice athletes the basic techniques of rowing. The following year the men’s team started racing other schools and competed for the first time at the Dad Vail Regatta in Philadelphia. Starting with about twenty athletes the first year and thirty the second, the team steadily grew during the nineties and continued to add to its list of accomplishments. 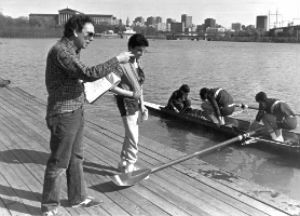 Chuck and his coaching staff continued to follow the “Sprints Style” of building a program by concentrating on fielding both competitive Varsity and Novice boats, rather than combining the two. In the early nineties, the Dad Vail was the only collegiate championship regatta for clubs who were not invited to Eastern Sprints. In 1992, Chuck guided his crew in their first competitive season to a second place finish behind the University of Massachusetts at Dad Vails in what was then called the O’Brien Cup. In 1993, the program won its first Dad Vail championship in the Men’s Freshmen Lightweight eight, and followed up in 1994 with a repeat championship in the Freshmen Lightweight eight and a bronze in the Varsity eight. Chuck continued to coach both programs until 1995, and at the ’95 Dad Vail had the men’s and women’s Varsity eights in the grand finals. By 1996 the team consistently had at least four competitive eights at both the varsity and freshman levels, and continued to improve its finishes at regattas. That year Delaware’s Varsity eight finished second at Dad Vails behind Temple University. Chuck left the program from 1997 to 2000 to return to coach at St. Joseph’s Prep in Philadelphia. During this short period, the team had five head coaches between Al Vople, Ed Chan, Frank Skomorucha, Mike Keating and Nate Clark. In the spring of 1999 the team moved from Wilmington Rowing Center to its current location 1/2 mile downstream at the WYRA boathouse. Roster numbers declined and the team focused on competing in fours. The program experienced success in the fours, with multiple medals at local and regional regattas, including a bronze at the Dad Vail in 1999 in the Novice four. With coaching support from John Williams, Chuck returned to Delaware Crew in 2001. Without the ability to give the scholarships needed to attract heavyweight high school recruits, Chuck decided to concentrate at first on building a lightweight program because the team would be able to compete on a level playing field and better develop as a whole around that category. By 2003, Delaware lightweights had become a highly competitive crew. With the varsity boat containing two future national team members, Evan Price ‘04 and Ivan Baldychev ‘06, Delaware won the Dad Vail lightweight event and finished sixth at IRAs, knocking off the previous year’s winner, Yale. With financial assistance from the Dad Vail committee and the University of Delaware Alumni Association, in 2003 Delaware was able to travel to England to compete in the Henley Royal Regatta. After advancing to the second day by beating Trinity College – Dublin, Delaware lost by a length to eventual Temple Cup champions Oxford Brooks. With the credibility established by the ’03 lightweights, Delaware began to recruit even more lightweight rowers from high school and began to enlist heavyweight rowers who wanted to row for the program. To manage the growing size of the program, Chuck brought in coaches Vince Puma to coach the freshman lightweights, Joe Kleiman to coach the freshman heavyweights, and Andy Belden to coach the varsity lightweights. From 2004 to 2007, Delaware lightweights were able to compete in the Eastern Sprints championships and also supplemented their duel racing schedule against the Sprints programs. Additionally, both the lightweight and heavyweight squads were able to compete at the IRA National Championship until 2008 before the anti-club ruling in 2009 – with the lightweights in the eight and the heavyweights in small boats. In 2007, the last year Delaware was permitted to compete at Sprints, the Lightweight four was victorious at the Eastern Sprints championship. 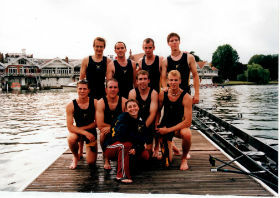 The heavyweights began developing their own success, with the Varsity eight winning the CAA championship in 2002, 2003 and 2005 to 2007. Additionally, in 2006 Chuck was able to place both the varsity and junior varsity eights in the Dad Vail grand finals, starting a stretch of steady growth with the heavyweight program. It was also during this period that Joe Kleiman began having success with the freshmen programs. The freshmen heavyweights garnered a silver medal in 2007 and both the Freshmen Heavyweight eight and Freshmen Lightweight eight won the Dad Vail championships in 2008. Complementing those victories with a Lightweight eight silver medal, the program was able to win the men’s team points trophy and claim the Kerr Cup at the Dad Vail for the best men’s team performance, a title the program retained in 2009 (co-winners) and 2010. In 2009 the program earned the overall team points trophy for men’s and women’s teams combined, as one gold and two silver medals coupled with the UD women placing fourth in the Freshmen four garnered the trophy. In 2008 and 2011 the program placed third in the overall points trophy standings at the Dad Vail championship, and in 2010 and 2014 placed second. During the spring of 2009 under coach Joe Federici, the varsity lightweights won the Dad Vail championship in his first season. With Federici at the helm of the lightweight program until 2012, the varsity lightweights saw a period of increased competitiveness in duel racing. Additionally, the varsity lightweight athletes were key rowers in the combination Varsity eight UD raced at the 2010 and 2011 Dad Vail Regattas, which yielded silver and bronze medals, respectively. Despite the top 6 lightweight rowers in the Varsity eights in 2010 and 2011, the Lightweight eight was still able to earn silver medals both years at the Dad Vail Regatta with second varsity and freshmen rowers filling the ranks. From the formation of the American Collegiate Rowing Association, Delaware’s Varsity eight has consistently been ranked in the top 10 of the ACRA polling, but in the May 2010 USRowing Poll earned a top 20 national ranking amongst all varsity and club eights for the first time in program history. In 2012 Joe Kleiman was elevated to head coach of the heavyweight program, while Chuck continued to serve as the director of rowing for both squads and focused again on the lightweights with Joe Federici. At the 2012 Dad Vail regatta the Freshmen Lightweight eight won another championship, while the Lightweight eight earned silver. At the end of the 2012 season Joe Federici departed for a coaching position at the US Naval Academy and Chuck again headed the lightweight squad. In 2013 the Lightweight eight displayed competitive speed during duel racing, and in the May USRowing poll earned a fifth place ranking nationally, a program high mark at the time. At the 2013 Dad Vail regatta both the Lightweight eight and Freshmen Lightweight eight won championships. At the 2014 Dad Vail Regatta the Lightweight eight, Freshmen eight and Freshmen Lightweight eight all earned silver. Also during this period Delaware began sending select crews to compete at the American Collegiate Rowing Association (ACRA) national championships. In 2013, Delaware sent a Varsity Lightweight four, which placed third. In 2014, two Delaware lightweight oarsmen won the programs first ACRA championship in the Varsity Double (2X), while Joe Kleiman’s heavyweight crews finished sixth in the Second Varsity eight and seventh in the Varsity eight. In 2015, the Lightweight program had a thrilling performance in duel racing against Harvard University. Both the Lightweight eight and 2nd Varsity Lightweight eight were victorious against Harvard, a first for any Delaware varsity crew. This victory set another high mark for the program in USRowing polling, as the Lightweight eight rose to a third place ranking nationally in the April poll. At the Dad Vail regatta, the Lightweight eight won, while the Freshmen eight and Freshmen Lightweight eight earned silver, and the Freshmen four won as well for the first time in program history. At the 2015 ACRA national championships Delaware again regained the Varsity Double (2X) title and won another championship in the Lightweight Novice four. The Lightweight eight raced a composite lightweight crew and finished eighth in the Varsity eight grand final. As Delaware Men’s Crew continues to grow in size and increase its level of competition, the team is grateful for increasing support from coaching staff, alumni, parents, and other donors of time and money.